It's been many years since I started a content strategy or website redesign project with an audit of the existing content. I don't start with an audit because I focus on a future vision of what the content could be instead of working out how to change what exists. Eventually, the audit happens, but not until we've finished the modeling and user journey work. That way we have something to audit against. After a recent experience as the user of a website, I realized there was another reason starting with a content audit doesn't serve the organization conducting it: A content audit before anything else does not account for the user journey or the experience someone might have when interacting with the content. "By simply auditing what your site offers now ... people are missing a huge opportunity to turn their site from an organisation-focused site to a useful, accessible, user-centred site." Let's take a look at an example of content that isn't poor but doesn't help me complete my journey. I don't typically use real sites and call out organizations, but this was the experience that led me to this realization. Context: I had donated to the National Archives Foundation Vietnam 50 project to honor my father, a Vietnam Vet. I was texting with a friend and trying to explain about the exhibit and project and just wanted to send a link to explain. So I was on my phone doing this in between text messages. I knew that the National Archives Foundation was responsible for the project and exhibit. So I went to their home page. After a few scrolls, I ended up at the Exhibit photo and clicked Learn More. So far so good. 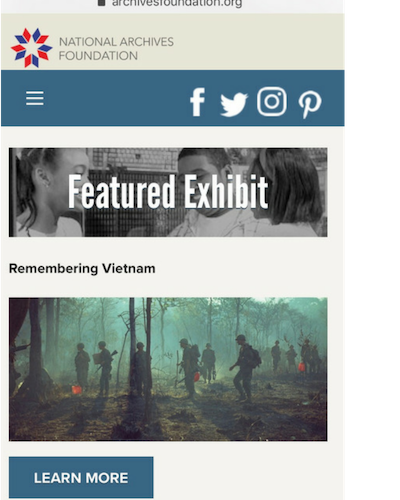 I end up on the Remembering Vietnam Exhibits page. Remembering Vietnam page in the Exhibits section lists the dates, location and a summary of the exhibit. As I scan, I see that the exhibit follows the trajectory of American involvement in Vietnam...blah blah blah. I'm thinking, "So about the part about donations?" Though I'm wondering if the archives.org/vietnam link would have more information, I click the Learn More button. Huh. Now I'm on what looks like the same page. But it's not! It's the Remembering Vietnam page but it's still talking about the exhibit. Remembering Vietnam page separate from the Exhibits section, also lists dates, location, and a summary of the exhibit, but also with additional information about the initiative. The content is the same until you get past the last paragraph. There is a button to Take a Virtual Tour (last time it was Learn More - I still haven't learned more. I'm getting frustrated.) That link to archives.gov/vietnam is looking more tempting! But I want to get to the page that talks about what I donated to. I barely see the Honor a Veteran box and click it. There it is! The page I was looking for in the first place: the Remembering Vietnam initiative landing page. It may not seem like much - 3 clicks to get to where I wanted to be. But that was 2 clicks too many. I wasn't following a good "information scent" – the idea that users will "keep going as long as they continue to find links that seem to take them closer and closer to their goal." (Nielsen Norman Group) After two clicks that didn't help me get closer to completing my task, I grew frustrated. You see, these pages, out of context, are not bad. They might even get good traffic. But it's false traffic. Content type - what type of content is this based on our model? What is the user need and organization goal? Which step on the user journey does this content support? Does the content match the context for how the user got here and where they could go next? Is this content still current? There is another step of the journey that is missed – and would never be caught in an audit because it simply doesn't exist! In one section of the initiative page, it says, "Names of those who donate $50 or more, or the names of those whom they are honoring, will be displayed in the Remembering Vietnam exhibition in Washington, DC, and online." Of course, I didn't donate just to have my dad's name displayed, but that was a nice touch. My plan was to go to the exhibit (living in a suburb of Washington, DC has its benefits!) and take a photo of my dad's name and show him when I saw him at Christmas. I had received a certificate acknowledging the donation from me for my dad. So I knew it was official. Yet, nearly a month after I made the donation, when I got to the end of the exhibit and watched the scrolling list of people honored, my dad's name was not there. Even though photos are prohibited in the National Archives building, I was disappointed that his name wasn't there. What if I had brought him and wanted to surprise him? Well, it would also be online, so I'd show him the website. Except I still haven't actually found the web page where the names of people honored are listed. Missing content will never show up on an audit of existing content. It will show up on an audit of what content maps to your model and your user journey. There is a happy ending! I gave my dad the paper certificate at Christmas. He was pleased, and we had a good conversation about his experience since coming home from war 50 years ago. Oh, and my son thought that I was a really thoughtful daughter to do that for my dad. Want to have a happy ending for your organization and the people you serve? Let's do some modeling and journey mapping to see how your content stacks up. Get in touch to get started. Newer PostWhat is a headless CMS?